It is clear that internet usage has become irreplaceable in the current generation whether for social media and work or for entertainment and other reasons. Hence, it is becoming more essential for consumers to not only have access to the internet but also to have fast and stable internet connection speeds. Nevertheless, with more devices requiring an internet connection, it has become even more critical to managing the overall consumption to maintain a reliable connection while also minimizing costs. 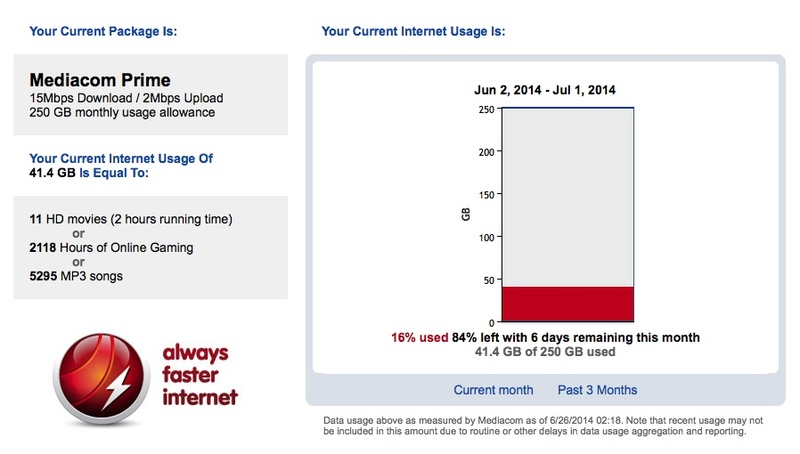 According to Mediacom’s website, the company doesn’t apply any data caps on internet usage. Data caps refer to the restrictions on the amount of data that a client can consume through their internet connection. Most ISPs will allow users to get a specific amount of data, like 1TB and then charge an extra amount for any data usage that goes above that capped limit. Instead of using data caps, Mediacom applies customized usage allowances based on the specific internet package. That is why it is necessary to track your internet consumption to ensure that you aren’t consuming more than what you signed up for when you selected a Mediacom internet package. Mediacom’s use of internet usage-based pricing is one of the techniques that ISPs use to make sure that their networks can provide reliable and consistent bandwidth to all their customers through properly managing excessive use. However, many consumer advocacy groups and even online streaming distributors have protested that this type of usage-based pricing would inhibit the acceptance and growth of TV streaming. Nevertheless, it is up to customers to ensure that they track their internet usage as they will likely end up paying the higher costs afterwards. The first option of monitoring your monthly internet usage is to visit the Mediacom website, specifically the https://support.mediacomcable.com/#!/Log/In. Here, you’ll be asked to log in with the Mediacom ID that is linked to your account. So, ensure you have set up your Mediacom account along with the ID before clicking through that link. The next option is to use the MediacomConnect app to check your usage. This app is available on both iOS and Android app stores and it comes with a user-friendly interface where you can easily monitor your usage. If you have ever got a notice that you have remarkably exceeded your internet usage by over 100GB or other obnoxious amounts, then you know that it can be a highly stressful experience. Also, when you try talking to customer representatives over the telephone, you find that all that they can give you is exactly the same data you can see online. This is a typical story for most clients who end up wondering how they ended up with such high amounts, given that none of their browsing habits had changed. According to representatives from Mediacom, the Mediacom usage meter works by monitoring data at your modem, including both the upload and download data. The growing rise of high-quality 4K video is a major culprit for sudden usage spikes. Other causes for high internet usages include third-party cloud storage service or having an open network where neighbours are downloading data through your connection. However, you also have to consider the possibility that Mediacom usage meter is not always accurate. Change your Wi-Fi password: Changing your Wi-Fi password is highly recommended if you notice any surge in internet usage as it will ensure that no unidentified people are using your internet. Run isolation tests: Only use one device on your network before you add another device. The aim of the isolation test is to check whether that device is responsible for that abnormal data usage. Check apps on your devices that run in the background: Certain apps on your devices could be the reason for faulty meter readings as they are constantly downloading updates, which consume lots of data. Third-party usage: Some members of your family could be doing bandwidth intensive tasks like downloading games, which could further increase your internet usage. Set caps for connected devices: You can also monitor the bandwidth usage on each device and identify the devices that are consuming too much data.